from the “Land of Lincoln” and all the women of USA, THANK YOU! Thank you. My beautiful Grandmother was an immigrant from Quebec. We are all sisters! Love our friends from Canada . Thank you . 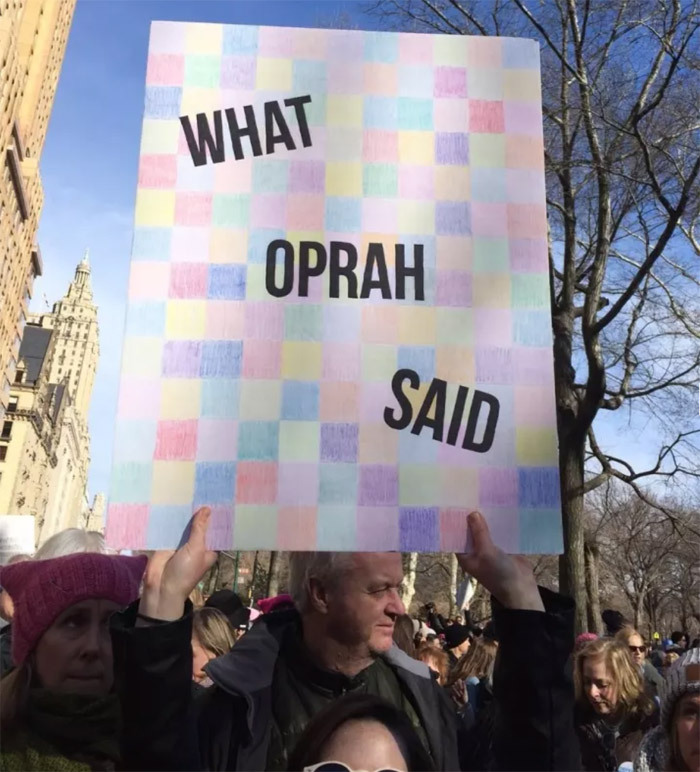 Your message means so much to your southern sisters . 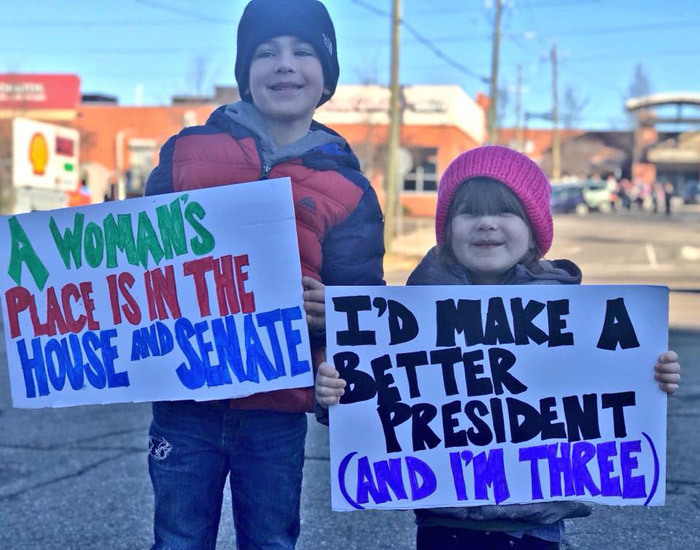 We women from Canada are with you 100%!…you go girls! We love you and support you! What’s the message??? 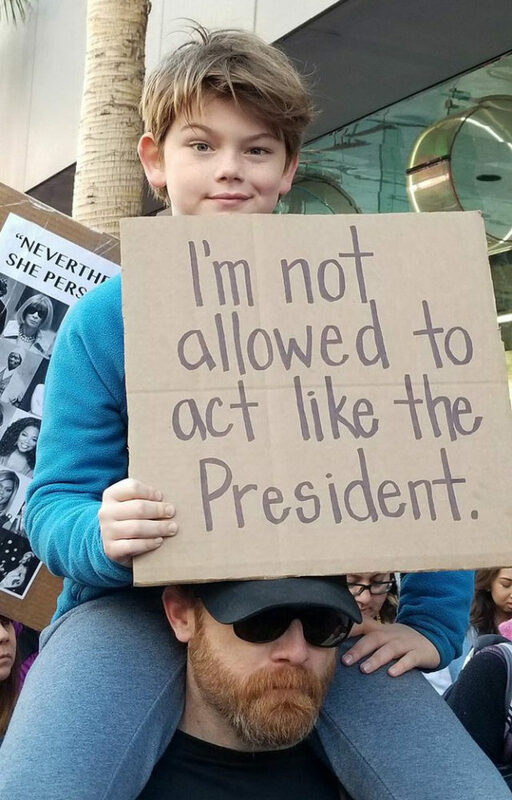 You don’t like President Trump. We get it. 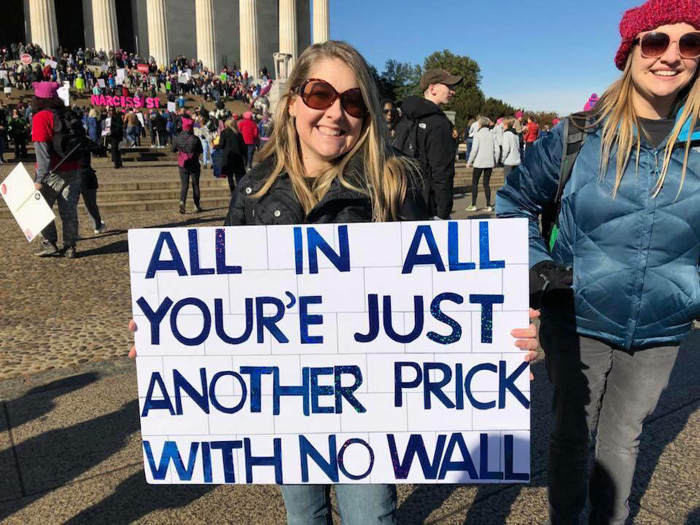 Do you have any ideas about policy or do you just like marching and being unneccesarily vulgar? Our policy and philosophy is clear: we do not want a fascist dictator running our country. My grandfather fought fascists…we embrace diversity, because after all, we ALL came from somewhere else, we acknowledge that a sexual predator should be in prison not in the Oval Office, and we don’t want a Russian agent getting his hands on nuclear codes. Anything else you need to know? Thank you. You are the voice of reason. They are a bunch of hateful do nothings who need a purpose and angry because they don’t have one. Thank you so much we sure do appreciate your support we need it ! 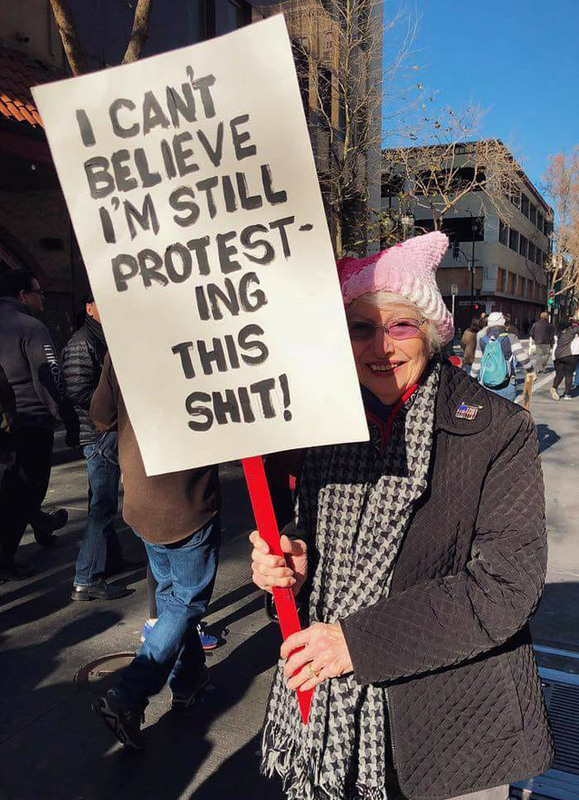 Looking at all the marching from London. We support you and will be out in the streets if “what’s his name” comes here. The Queen has said she will be having a headache, she is sure, when he comes so is writing her apology in advance for not being able to meet him. So it will be the prime minister and her cabinet for him and the rest of us in the streets not for him. I LOVE my UK friends! Thank you for resisting this imbecile! You mean like Scotland, in the UK? 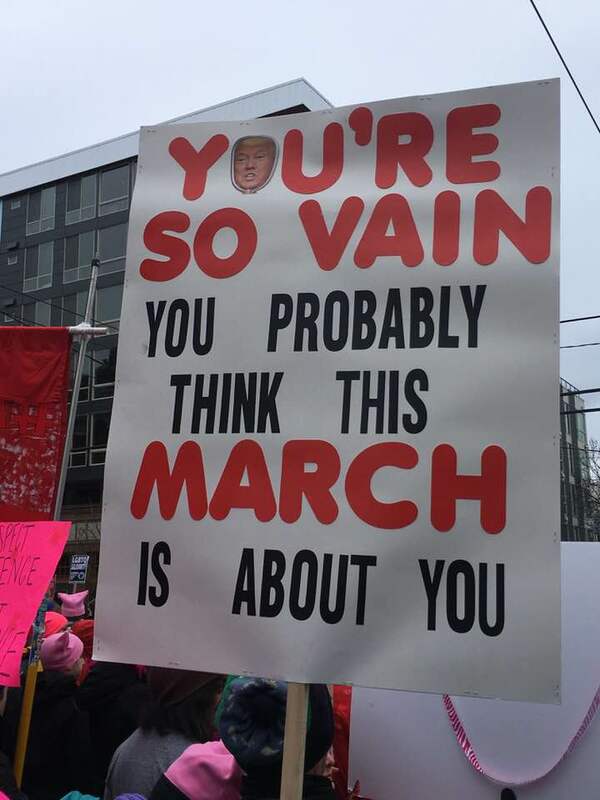 Many of the same signs appeared at the Ottawa march on Jan 20! Excellent. 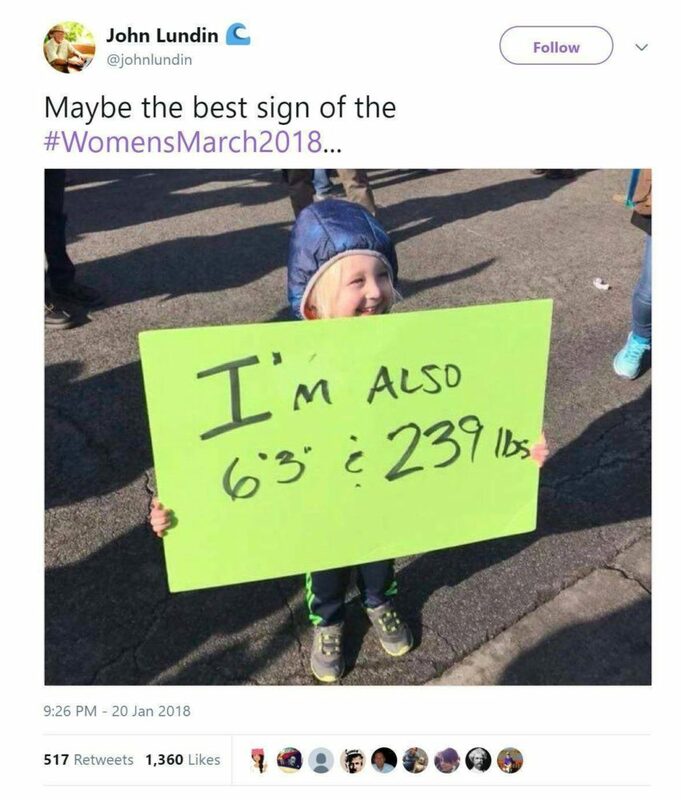 Wish I was there at the march! Waiting for November 2019! And then on to November 20! 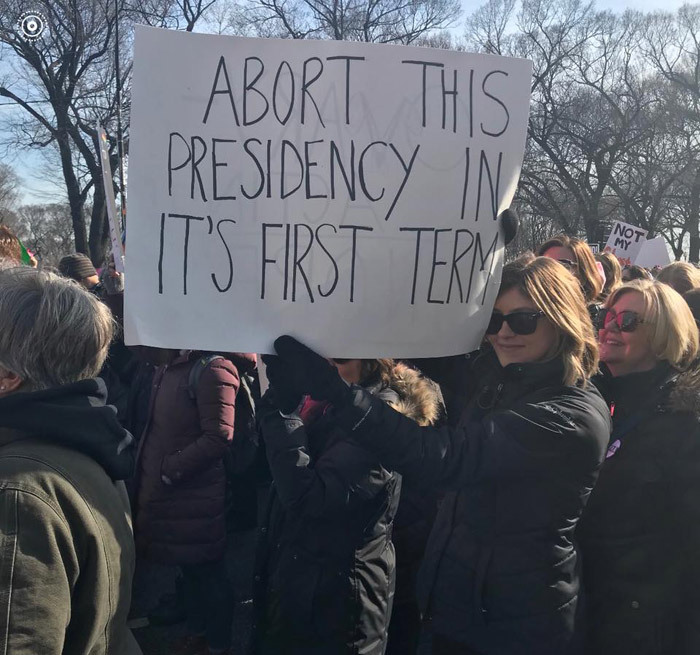 I am truly hoping we won’t have to be in Women’s Marches in 1019 and 2020. I don’t think the people or our democracy can take much more of Trump and his cronies. You guys need a platform besides just complaining. Get it together. 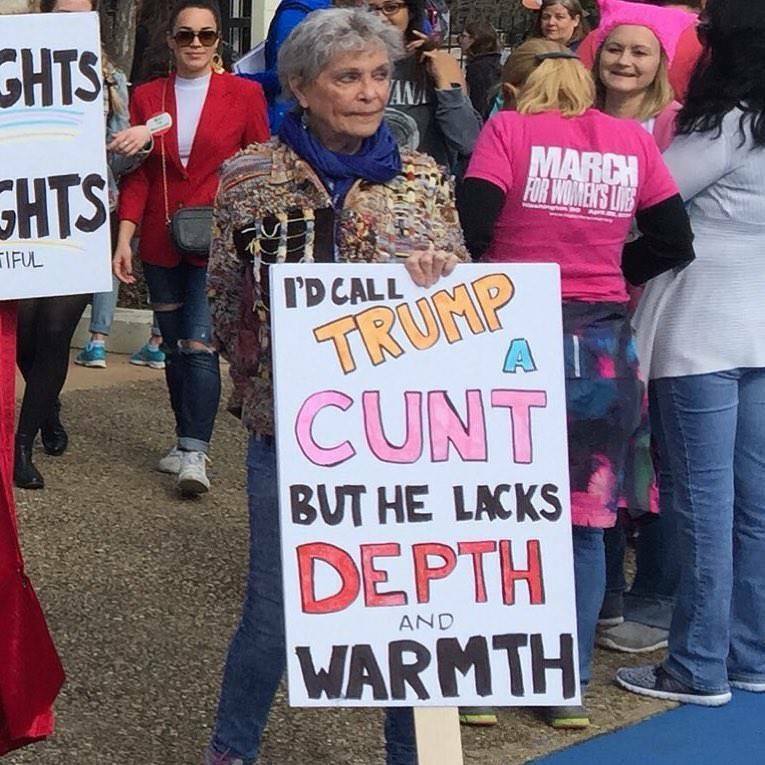 You just look like a bunch of angry women who don’t really have legitimate ideas. Do have a lot of unnecessary, over-the-top vulgarity. And what’s with bringing little kids to this and exposing them to the vulgarity? Not a good idea. d stier: Heaven forbid we see angry women anywhere!! Women must always be sweet and docile and teach their daughters the same, correct? 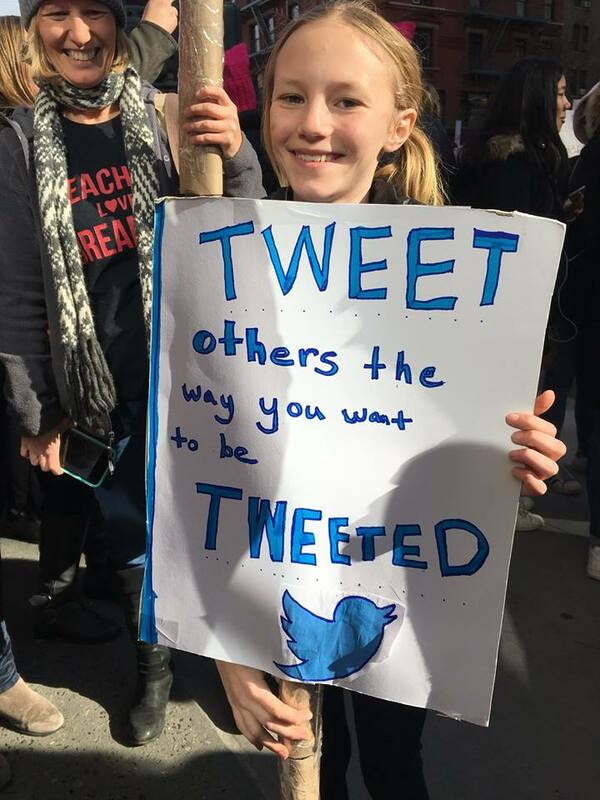 I prefer to teach my daughter to stand up for what is right, for justice…and if that includes a little swearing, so be it. 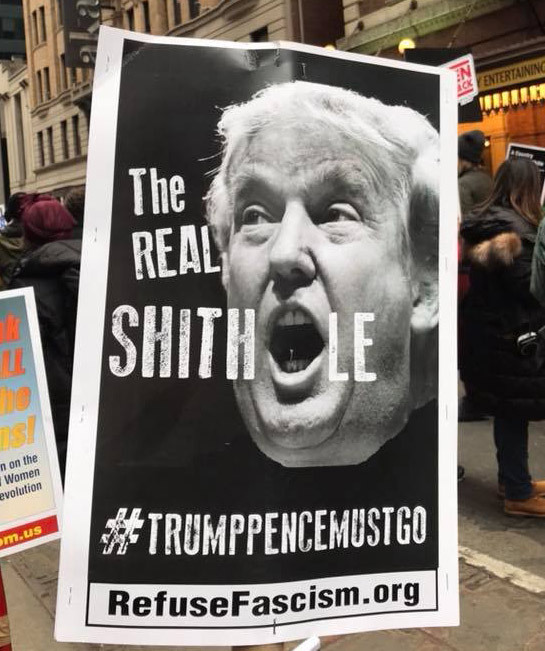 There are worse things in life than vulgarity, like ripping families apart and deporting them, or children not getting enough to eat because their parents are making minimum wage, or veterans who fought for this country being left without the support of meal programs for the elderly that they previously relied on; redirect your outrage to where it belong….you sound silly and elitist. Let’s hope and pray he doesn’t last that long. Laughed so hard i cried…by the way i live in a shithole country in Africa. Would vote him out from here if i could!!! I love the countries I’ve visited in Africa! I live in California, have traveled all over…..and truly, you are some of the nicest people in the world! I’d love it if you could! Kudos to all babies, girls, mom’s, grandma’s & great grandma’s! We will not lose our voice or our power! 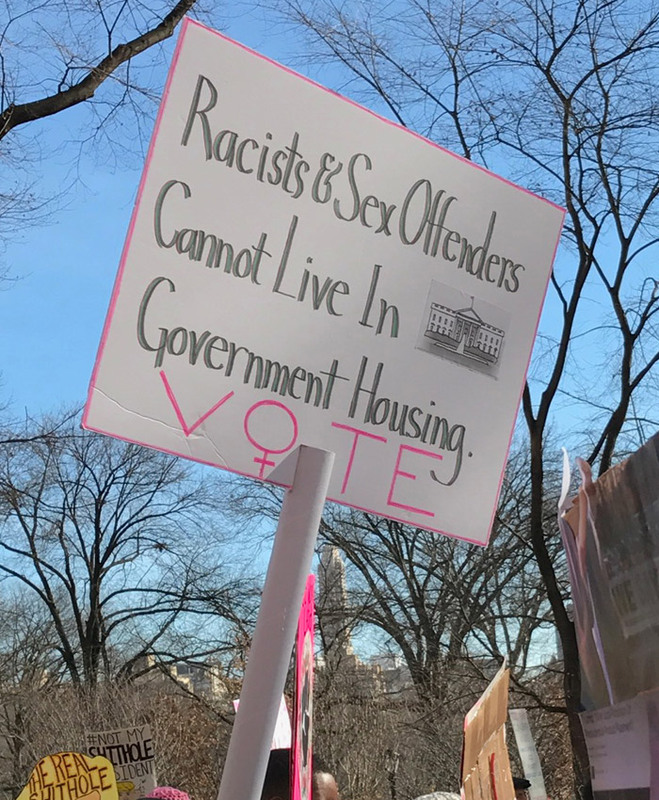 We marched for all who could not. 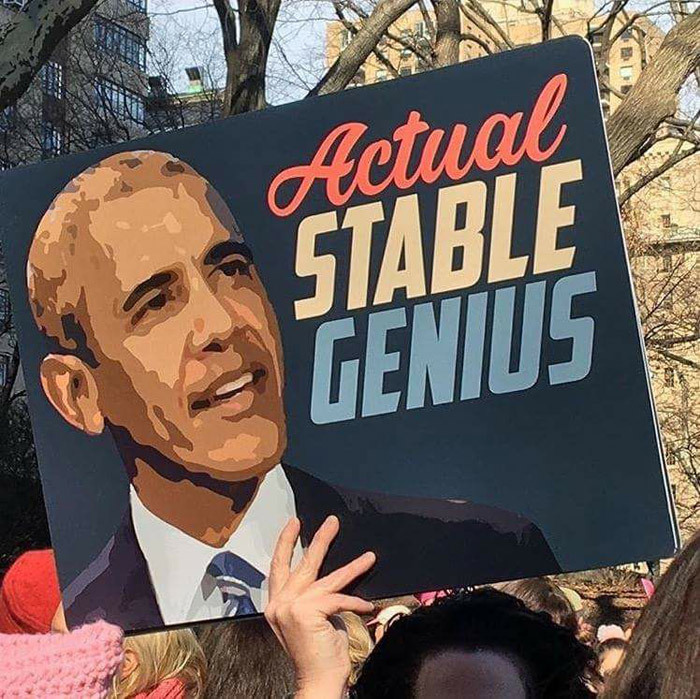 That was a good sign too. 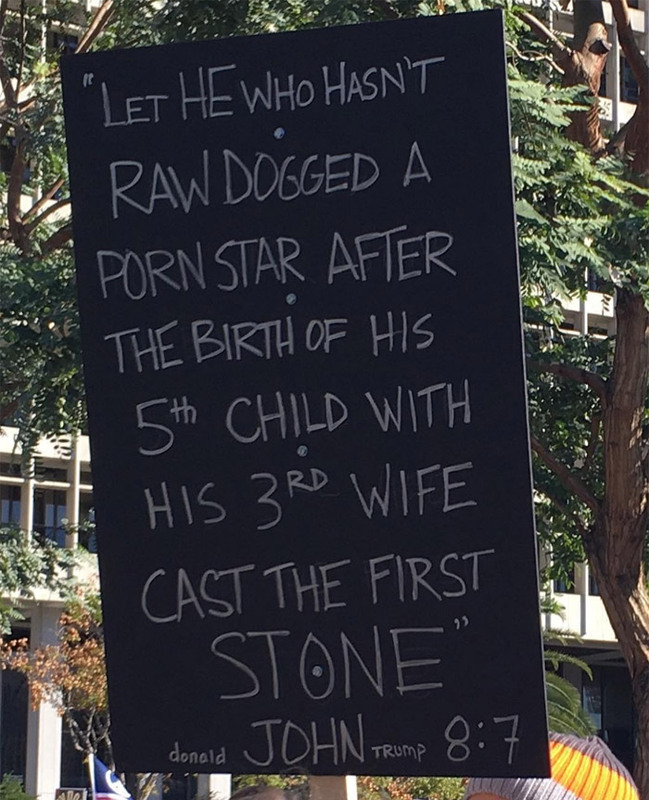 I marched in FL and saw many amazing signs. Thanks to those in other countries expressing solidarity! 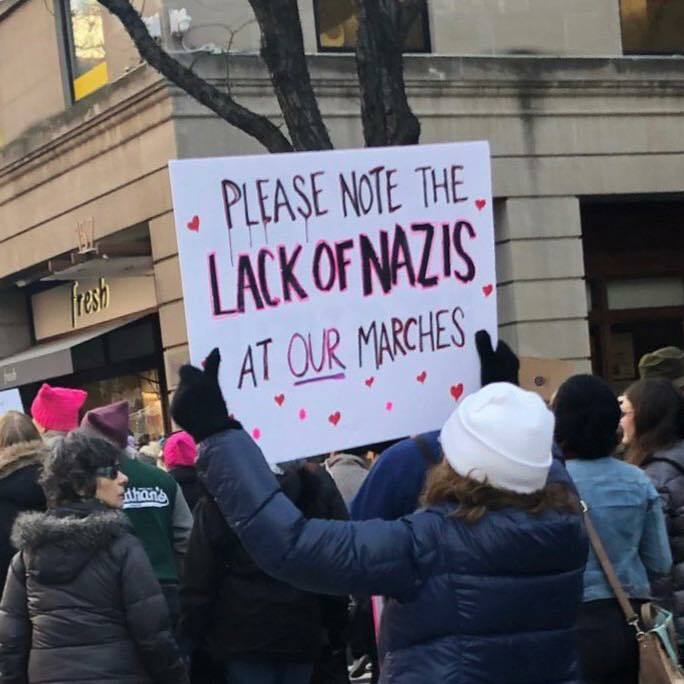 Thank you for marching when. I cannot. Stay strong my sisters. 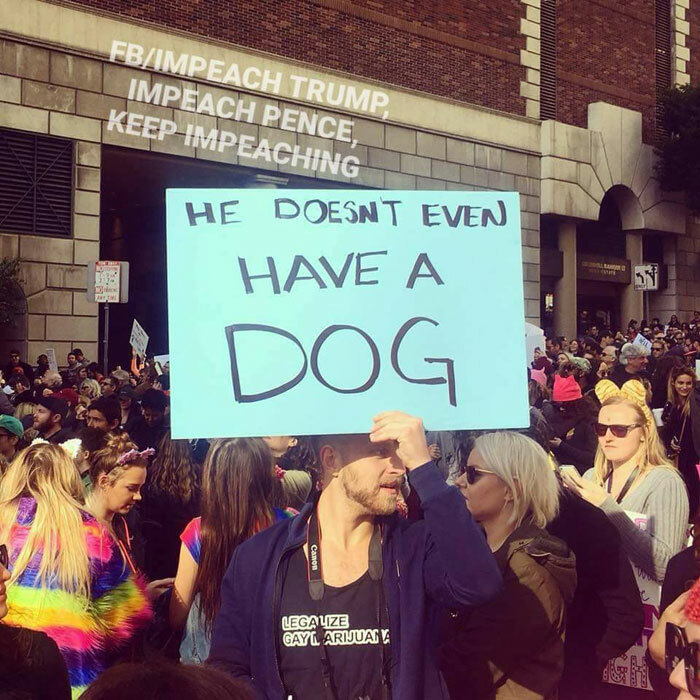 I am a #MeToo MAN and I encourage you women to keep protesting until Trump is impeached. If we are lucky, Nancy Pelosi will get to be our 46th president. Stay strong sisters. Stay strong. 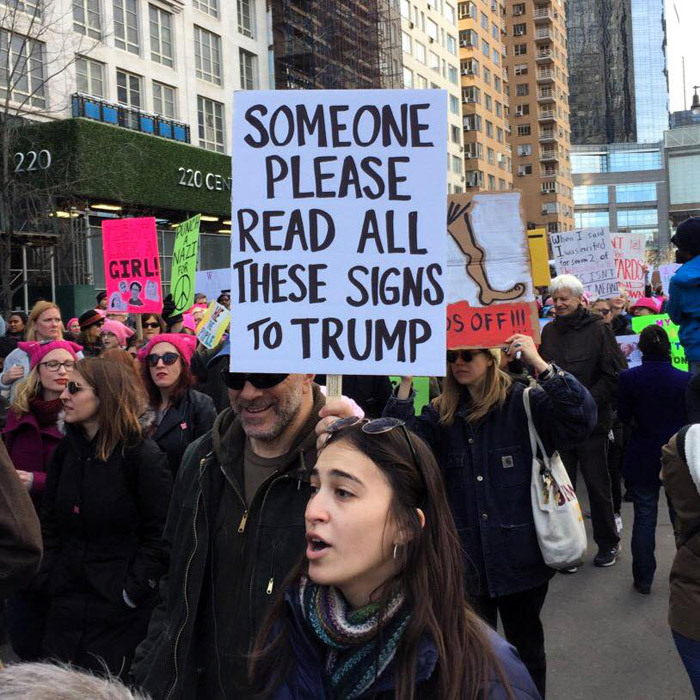 I laughed aloud and felt cold chills as I read all these wonderful signs. Poor health prevents my marching now, but my heart is with all of you, from the toddler girls to the 90 somethings. YOU ALL ROCK THE RESISTENCE!!! 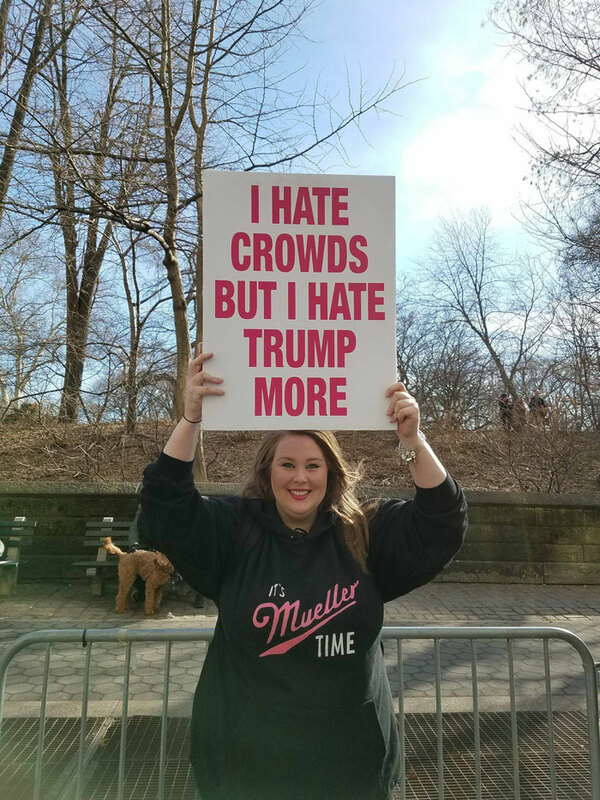 I couldn’t March, so I stayed home and made donations to embattled Democrats in the Senate (Brown and McCaskill) and any decent Democrat running against republican John Faso in Upstate New York District 19. Thank you all sisters and brothers everywhere for standing up for our moral fiber. I laughed out loud at your creative minds. 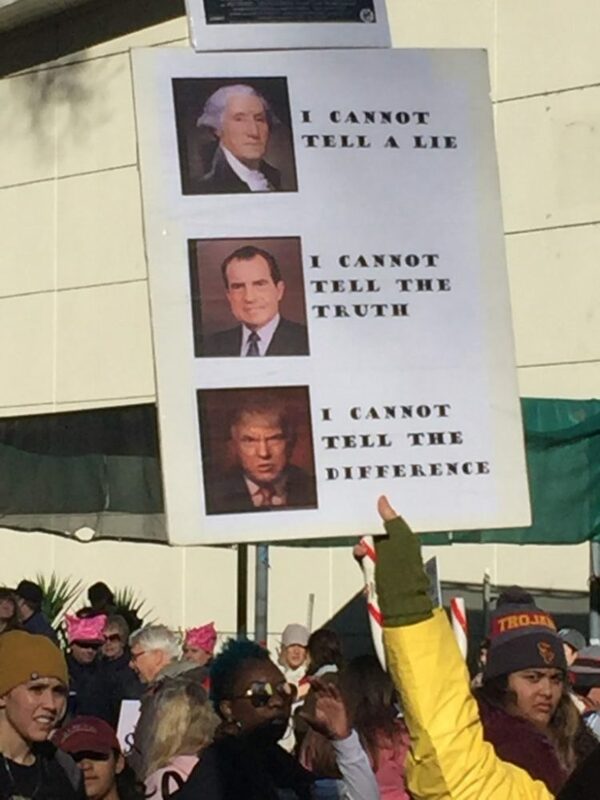 I felt the unity at the San Francisco march. It was a beautiful day for the world. The BEST belly laughs I’ve had in a very long time. You/we are so very creative & beautiful!!! The Women’s March in Denver was an empowering experience this year, as was last year’s gathering of men, women, children and dogs. 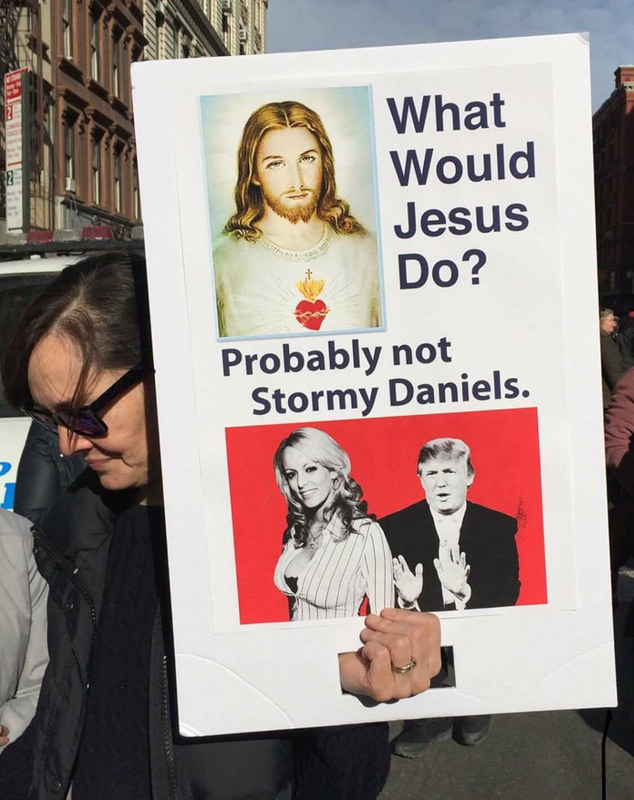 This year, though, had an especially sharp edge pointed directly to the disgusting behavior of the current occupant of the White House who has disrespected women for most of his lifetime, I suspect. The signs and crowds said it all, and sent a message that regardless of our age, color, marital status, sexual orientation, choice of occupation, physical abilities or disabilities, religious preference, or for any misogynist reason, we will persist to resist you DT and others who lie, disparage women, and attempt to deny our choice to make our own decisions regarding abortion. 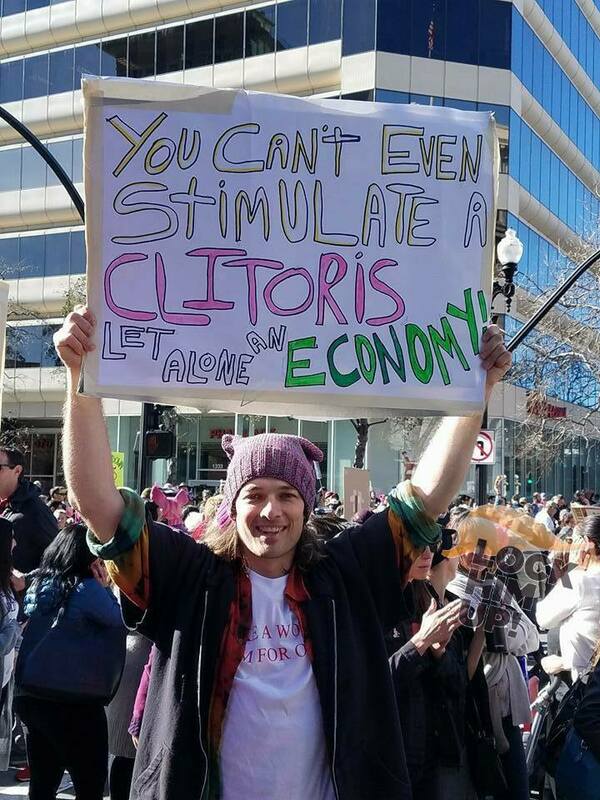 Real men don’t like Drumpf either. These are fantastic!!! 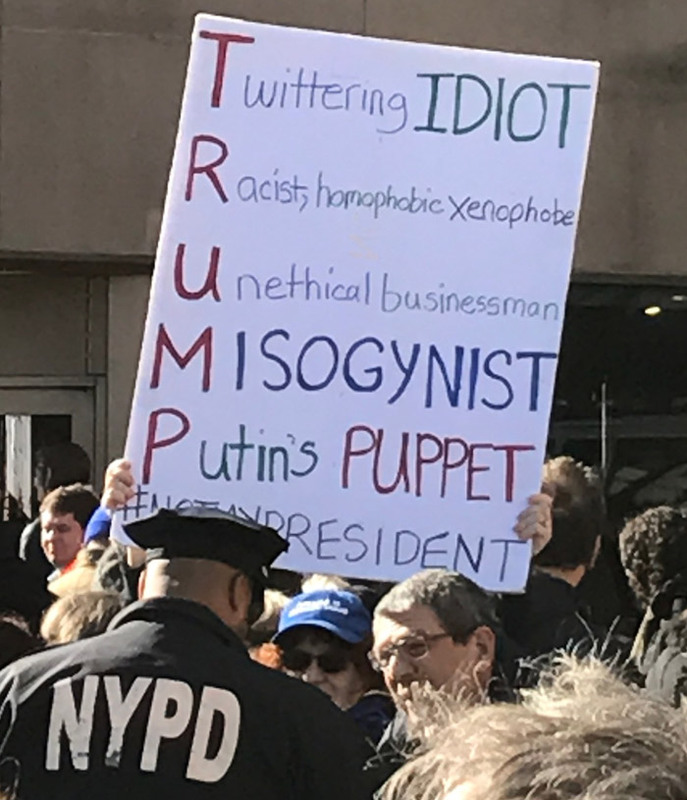 DUMP TRUMP!!!!! So proud of all of us for staying strong and loud for our country! 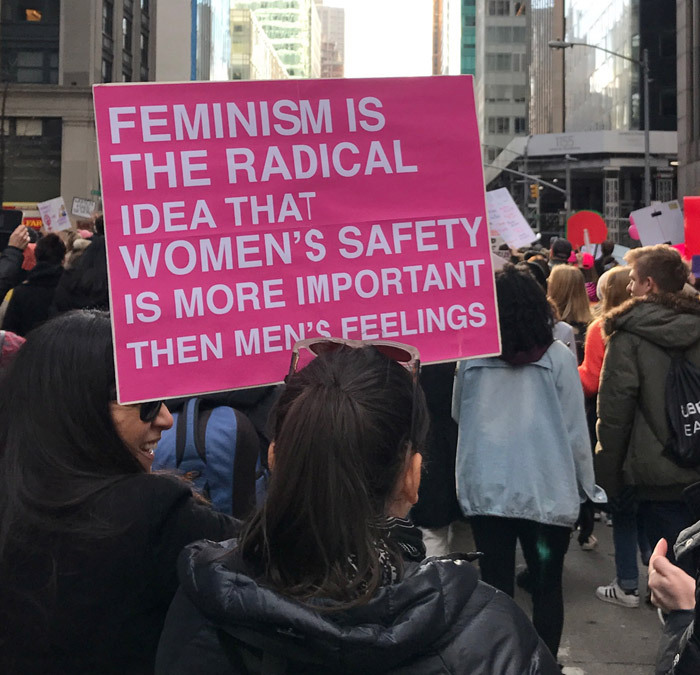 The creativity of these signs shows how deeply we care. 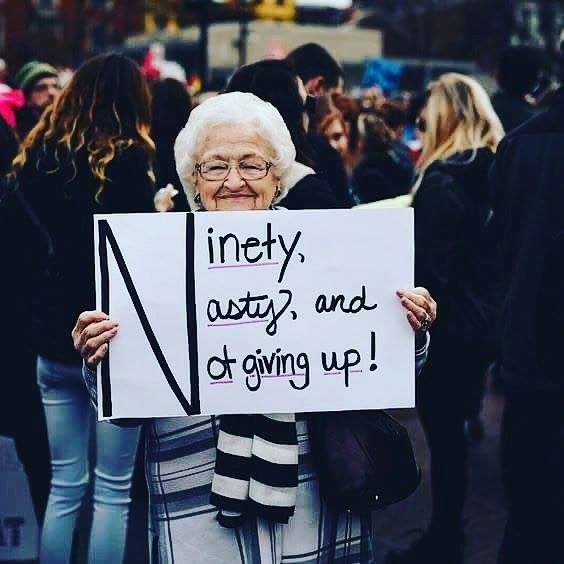 We won’t give up! We are the power. My mother experienced and survived so many of the injustices that we are marching against! 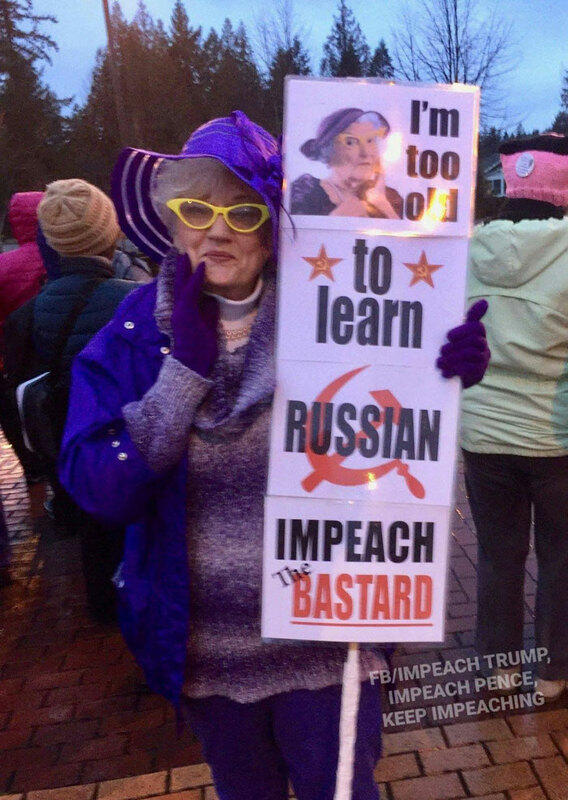 I am sure she would have been carrying a sign and marching against the evil occupying our government today! We must clear the government of this garbage! I will march, demonstrate, donate money to the good candidates, vote and encourage others to vote until we are free of Trump and can once again be proud of our country and our government!!! Putin put you where you are. 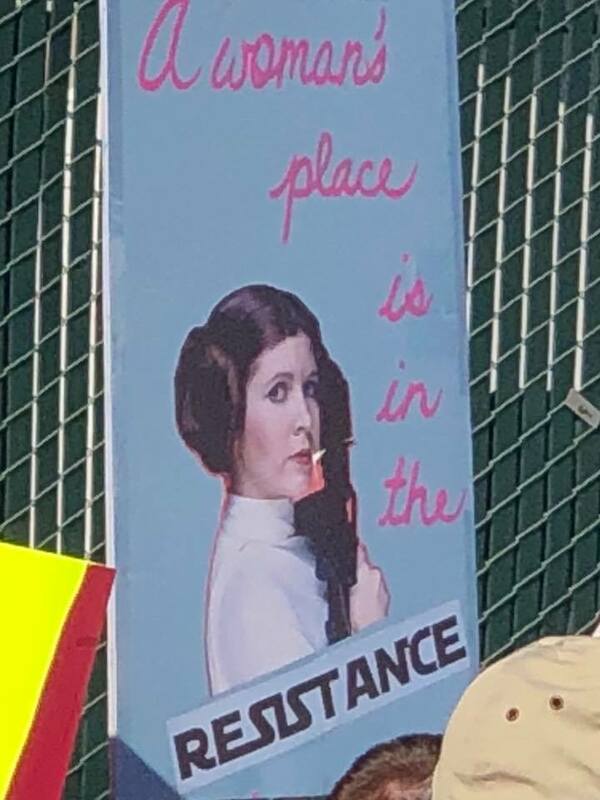 The resistance is strong! 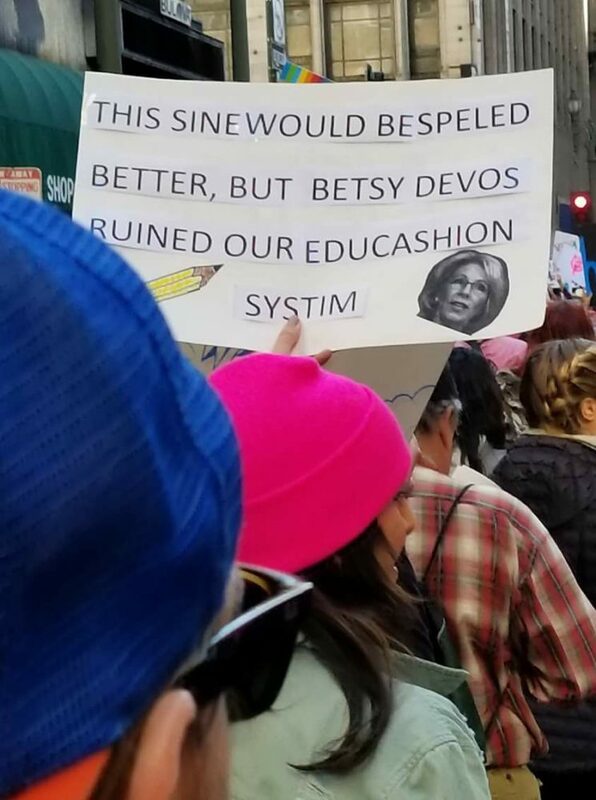 Thank you all for marching! And still she persists! 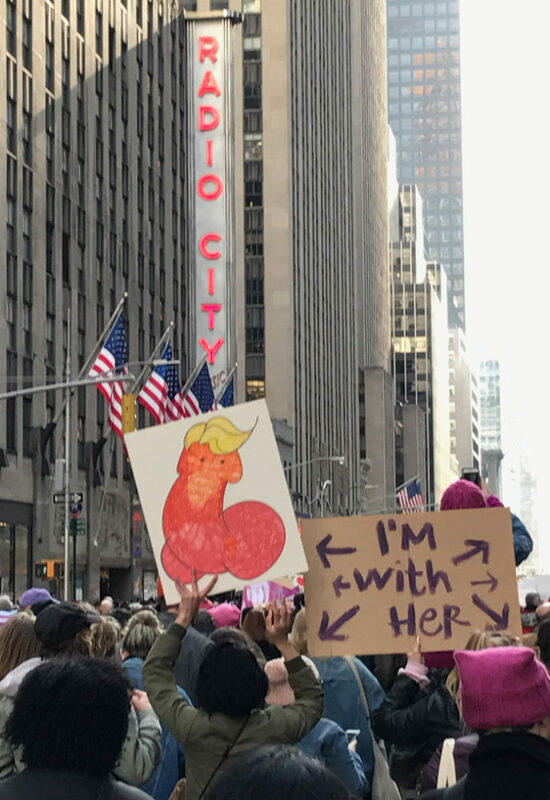 For any human being with a sense of decency, the Women’s March was full a vile and putrid displays that people should be ashamed of, if they had any real morality. It’s not funny, it a total lack of decency and many women see it that way. Policy? What policy? You mean that the GOP’s policy is to put down women, minorities or anyone with brains, and to stand behind (as opposed up to) Trump? The vulgarity is a bit over the top, BUT the demagogue-in-chief set the tone by bringing crass speech, which doesn’t belong even in the locker room, where he claims it began, and greed into his “whatever wins for him” so-called policy book. Embarrassing an entire nation, he will never be forgiven. What we need is a national American values clarification debate. We need to have a far better notion of the value of being an American, lest we experience a massive brain drain. Mr Stier, do you really think there is anyone more vulgar than Trump? Women have been told they must be nice. Look where that got them. Now very few men will mess with us now. 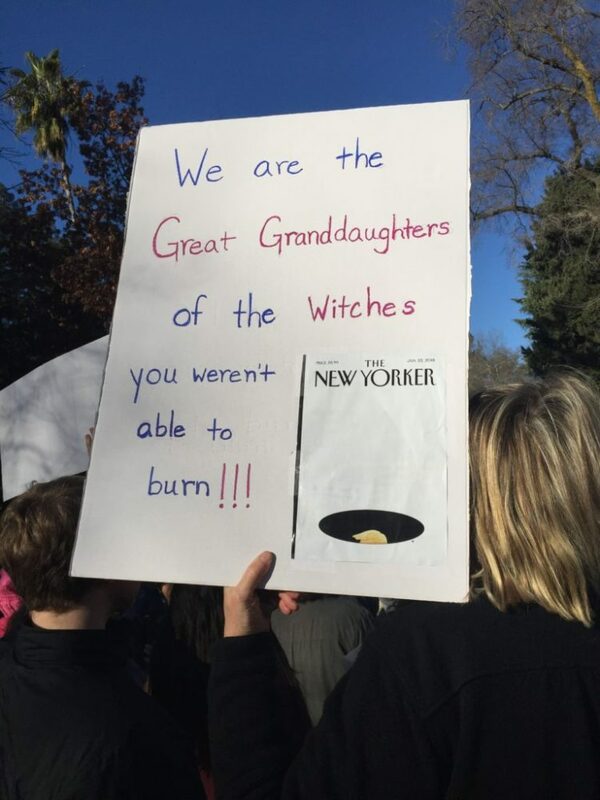 My favorite signs from the Chicago march were held by 3 generations of females. 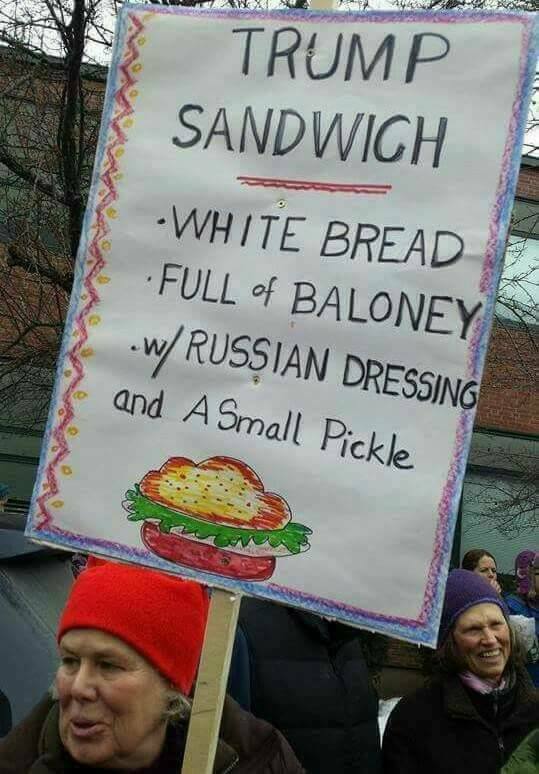 Grandma: I CAN’T BELIEVE I STILL HAVE TO PROTEST THIS CRAP. Daughter: GYNOS FOR REPRODUCTIVE JUSTICE. 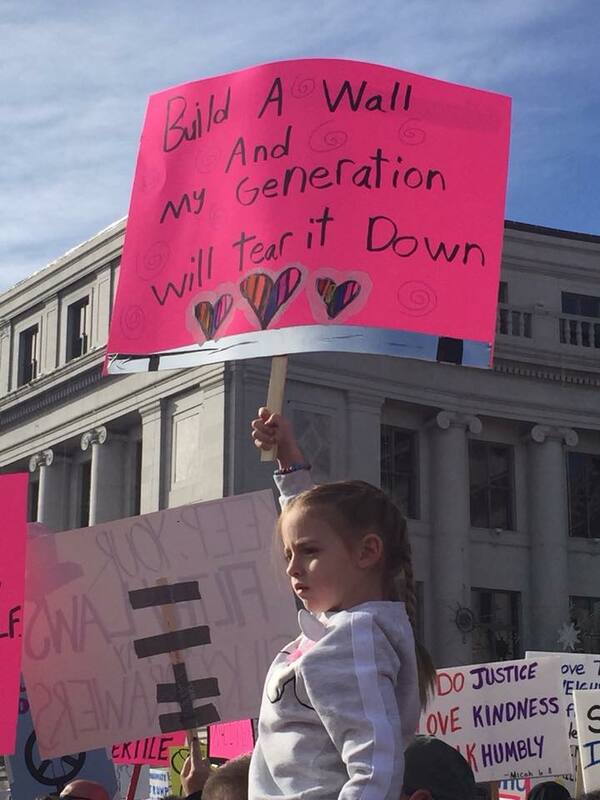 Granddaughter: THE FUTURE IS FEMALE. Another favorite: TRUMP WILL FLUNK HIS MIDTERMS. The other, high school girls, “Keep your rosaries out of our ovaries.” And the girls were juniors (will vote next year) at Lyons Township, a public HS. 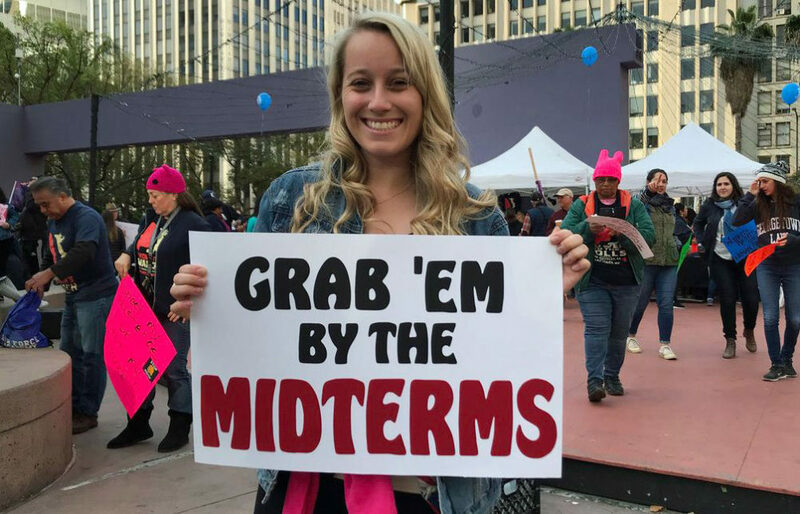 Get organized for Nov. midterms…Vote them out! Greetings from Idaho. 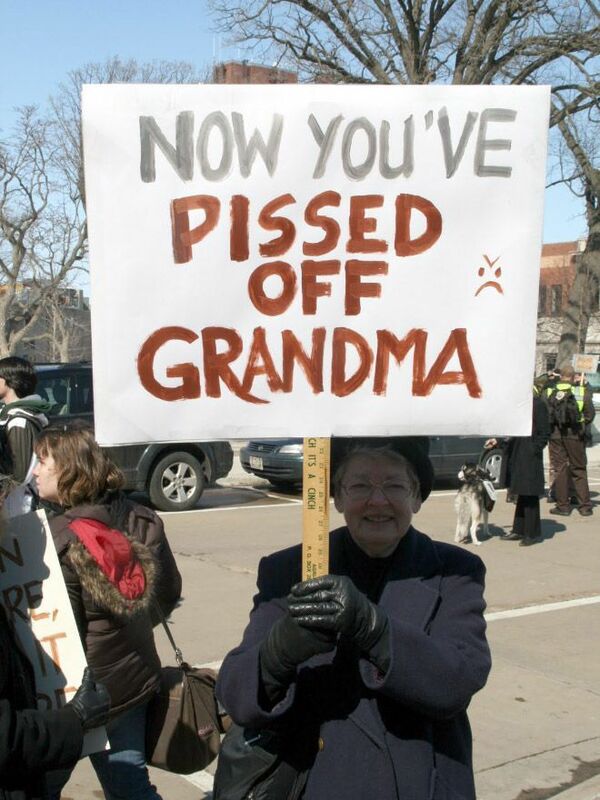 I am 83 years old and have lived in the time when a few Democrats actually could get elected in this very red state. All the ultra right Californians are eager to move to Idaho so they can move the calendar back about fifty years. 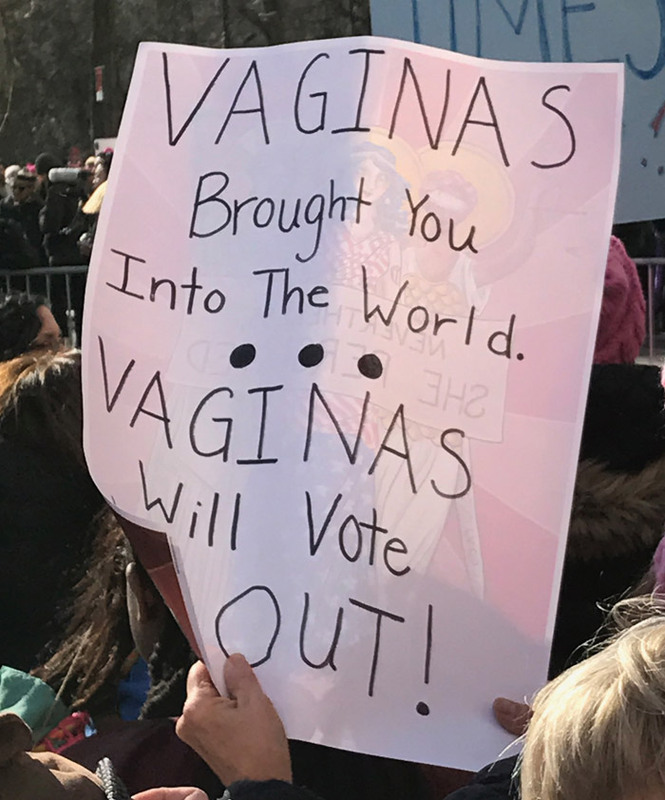 Thank you to all the marchers and all the wonderfully funny signs that are more than true. May I live to see the day that this damned state will see the light. Good to see people from near and far coming together for the cause. 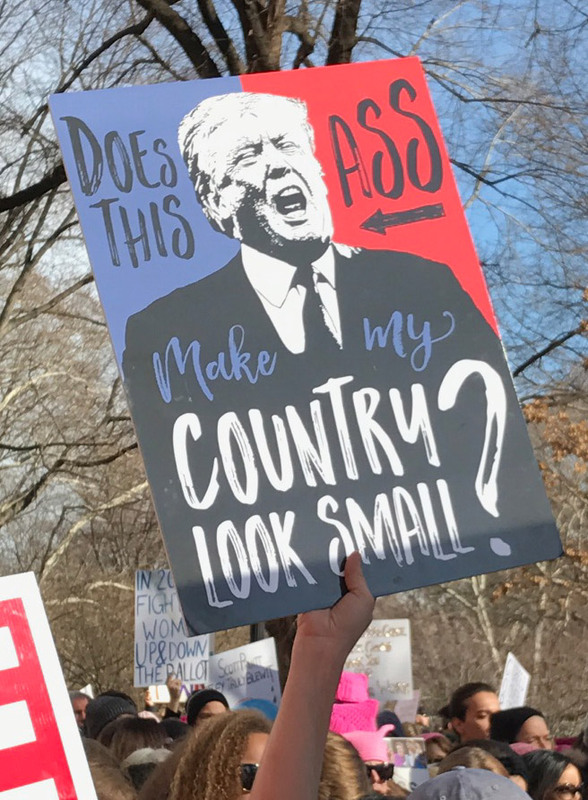 Shame on Trump for what he has done to his country and the world!!!! Fabulous celebration of freedom of expression! And some signs inspired by brilliance. Very well done. Your protest movement is an inspiration to the supporters of liberal democracy in South Africa. 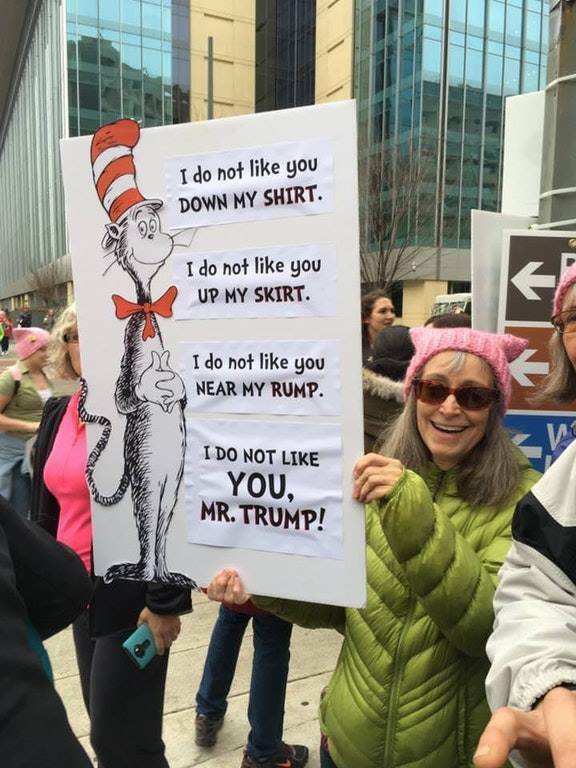 Best Signs Ever! 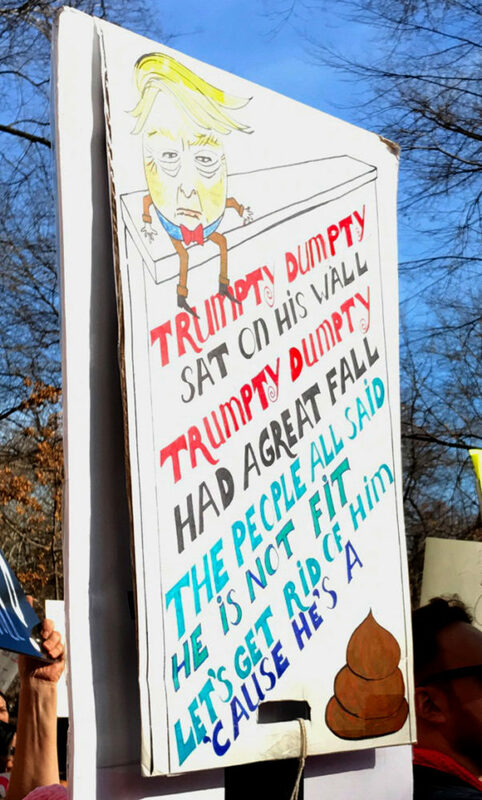 I hope Trumpty Dumpty saw them too, since he watches T.V.!!! !